A few months ago, I wrote a blog post about my L’Dor V’Dor moment in the Mississippi Delta, where I met one of my mom’s congregants from her student pulpit in Dumas-McGehee, Arkansas. Little did I know that another L’Dor V’Dor moment in the Deep South was just around the corner. You see, I have the great fortune of being the daughter of not one, but two rabbis. Thus, this L’Dor V’Dor moment involves my dad, his first student pulpit in Clarksdale, Mississippi, and a mezuzah. My dad has always spoken fondly of his pulpit in the Mississippi Delta. When I was growing up, he regaled me with stories of his time with the small Jewish community in Clarksdale. When he visited me in Jackson last year, he saw the photo that Bill Aron had taken of the synagogue in Clarksdale and immediately began researching how he could get a copy for his office on Long Island. In fact, one of the first questions he asked me when I became an Education Fellow back in the summer of 2015 was whether or not we worked with the congregation in Clarksdale. The sad truth is that the synagogue in Clarksdale had closed its doors a few years before…but that was only half of the story. While there is no longer a synagogue in Clarksdale, there are still a few Jews there – including a few Jewish children. 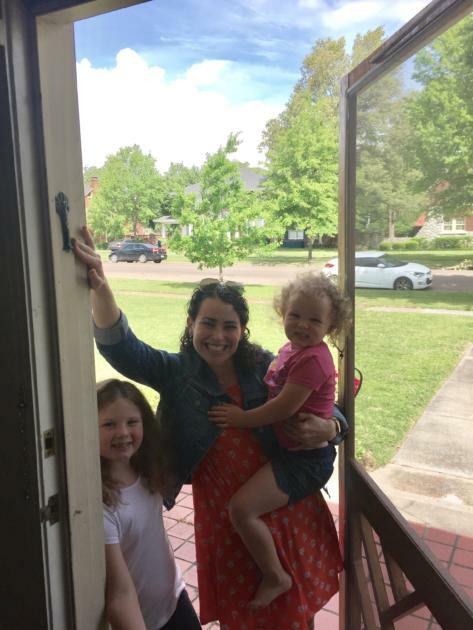 Since there is no religious school in Clarksdale, Lucy-Beth and Ada-Lynn drive (well, okay— their dad, Michael, drives) an hour each way for religious school at Hebrew Union Temple in Greenville, Mississippi. As you may remember from my last blog post, I served as Greenville’s ISJL Education Fellow and as such, have had the privilege of being part of Lucy-Beth and Ada-Lynn’s Jewish experience. On my last visit to Greenville, I decided that instead of the girls driving to me, we would do religious school in their home in Clarksdale. For an Education Fellow, an extra hour of driving is a breeze. During the drive, I called my dad to tell him that I was passing yet another cotton field, and he reminded me that he did this drive without a GPS. When I arrived at Lucy-Beth and Ada-Lynn’s house, they were waiting outside to greet me. Just like Abraham and Sarah, who were famous for being good hosts, I told them! Their father, Michael, asked if I could help them hang a mezuzah on their front door. I had never led a mezuzah hanging ceremony before, but I figured this was the perfect opportunity for my first one. I led the blessing from a siddur (prayerbook) and then explained what a mezuzah is and why we hang one. We practiced kissing the mezuzah as we walked through the doorway and celebrated this exciting Jewish milestone for their family. Their house is only a block away from the synagogue where my dad had his student pulpit, so I drove by on my way out of town. I was struck by the power of this moment. Here I was, in the very place where my dad began his career, continuing in his footsteps, teaching the next generation of Clarksdale Jews. Although the Jewish community of Clarksdale has dwindled since my dad’s student pulpit almost 30 years ago, I had the honor of hanging a mezuzah, a symbol of a Jewish home and a symbol that there is Jewish life, right back here in Clarksdale, Mississippi. Placing the mezuzah on that door was truly a dor l’dor moment!